The latest research reveals that the use of smartphones and tablets in the world has increased progressively in recent years. The visual and ocular discomfort associated with the use of these electronic devices is increasingly widespread. The symptoms are: headache, eye strain, dry eyes and pain in the eyes.The eye discomfort with smartphones and tablets is discussed along with similar symptoms reported with use of the desktop. Handheld devices differ from computers in terms of position and viewing distance, screen size and luminance and usage patterns. This review summarizes the literature available and considers them in the context of binocular vision and / or ocular superficial alterations aetiology.The types of symptoms reported with handheld devices are not dissimilar to those reported with computers, where research to date has focused. Adverse related effects caused by computer use are similar to those listed earlier and have been termed “computer vision syndrome”. This syndrome has been reported by 20–40 per cent of computer users and is associated with short- and long-term effects on the accommodative system and ocular surface. The symptoms experienced with digital device use may be associated with changes the accommodative system, including changes to accommodative accuracy, flexibility (accommodative facility) and/or amplitude. The evidence lead to support the effect upon accommodative facility is inconclusive. In addition, reduced fusional convergence suggests that the near point of convergence recedes with smartphone and tablet use, as well as it occurs with the use of computer. Evidence of the effects of handheld digital devices on blink rate are inconclusive, perhaps due to task difficulty, which also plays a role in reducing blink rate. In particular, digital devices utilization can affect blink patterns, ocular surface homeostasis and tear film function. These effects are likely to contribute to a variety of ocular discomfort symptoms: such as dryness, grittiness, foreign body sensation, burning, stinging, sore eyes, blurred vision, and dry eye disease. While the impact of handheld devices on tear volume is insufficient to support this evidence, at the same time it doesn’t seems to affect the computer use. 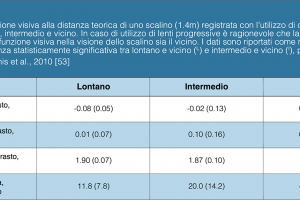 Other markers of ocular surface and tear function have not yet been investigated with smartphone or tablet use. Understanding the ocular and visual effects of smartphone and handheld digital device use is essential for developing clinical guidelines to minimise the ocular discomfort of users.